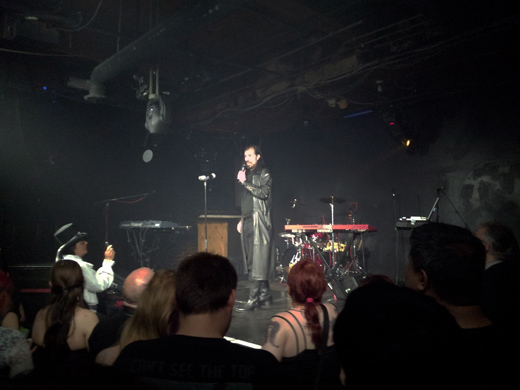 Gothic rock impresario DJ Patrick Rogers hosted the 15th anniversary edition of the venerable Philadelphia institution, Dracula’s Ball the first Saturday in June. The event is generally held quarterly, usually with a special Halloween edition (as will be the case again this year, 2013). In recent years the consistent venue is the vast, multilevel club, Shampoo, out on the northern, industrial periphery of Philly, among the factories, warehouses and barbed wire-enclosed storage lots. Those of us who have been attending for these many years recall a prior tradition of hosting Dracula’s Ball at Philadelphia’s Trocadero. Held four times a year, the event draws Goths of every stripe: those who love live music performances by big name groups within the darkwave/industrial genre; those who live to dance to recordings of that same type in dimly lit, crypts; and those who merely like to dress up in morbid-themed outfits. The main costume is vampiric, as the name of the event suggests, i.e. capes, amulets and fangs. Rogers himself addresses the crowd through an elaborate set of permanently implanted fangs. There are also less menacing steampunks in Victorian attire and cyber Goths dressed in post-apocalyptic style crowned with multicolored dreadlock extensions and wearing bulky boots. Studded black leather outfits are worn by the fetish crowd and concert tees by yet another contingent of attendees. There is no actual dress code, so at least one out-of-place nerd in a plaid shirt and jeans wandered aimlessly, as did a chubby matron wearing a white tee shirt that displayed her extreme muffin-top physique to great disadvantage. Among the most attractive was the impeccably dressed family of north Jersey celebrity hostess Madame X, along with her statuesque spouse Peter and their 6-year old son, who, impeccably attired in tails, seemed completely at ease mingling with even the most grotesque attendees at the ball. Three or more dance floors were provided at this multi-level venue, even including an outdoor space under a tent where the few die-hard cigarette-addicts were banished in compliance with Philadelphia law. 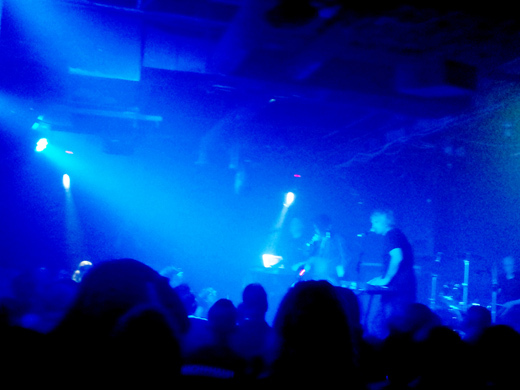 DJs Jack Phoenix, Solaries and Heaven Malone played every variety of EBM, industrial, darkwave and classical Goth. Some dancers migrated from one floor to another while others stayed put in the same spot all night, even missing the live acts. The first of these was the Canadian synthpop group Ayria that charged the spectators up with a high-energy stage performance fronted by the charismatic and talented vocalist Jennifer Parkin. They proved a tough act to follow, even for the more famous German group, Project Pitchfork, whose performance was all but obliterated by ear-and skull-splitting noise, incomprehensible vocals and instrumental cacophony. Their lack of distinguishing qualities and incoherent music left this reporter with the impression that their fame rests upon being the lowest common denominator in the genre.